Surprising your kids with a trip to Disneyland? I’ve got something to help you make the announcement in style! When I was 12, my family went to Disney World for the first time (I’ve mentioned this before — it was epic). But my parents didn’t just say, “Hey kids, by the way, we’re going to Disney World next month.” Ohhhh no. Instead, they planned to surprise us with it at Christmas. Cue the shrieking. We were so, SO excited — talk about an awesome surprise. Better yet, we had a few months to plan and build anticipation as we got ready for the trip. (Did you know research shows you actually get MORE happiness out of planning the trip, than actually taking it?!) Now, 22 years later, my siblings and I still fondly remember that Christmas morning as one of the best presents we’ve ever received. So — with that in mind — I want to help you plan the best surprise ever for YOUR family too. 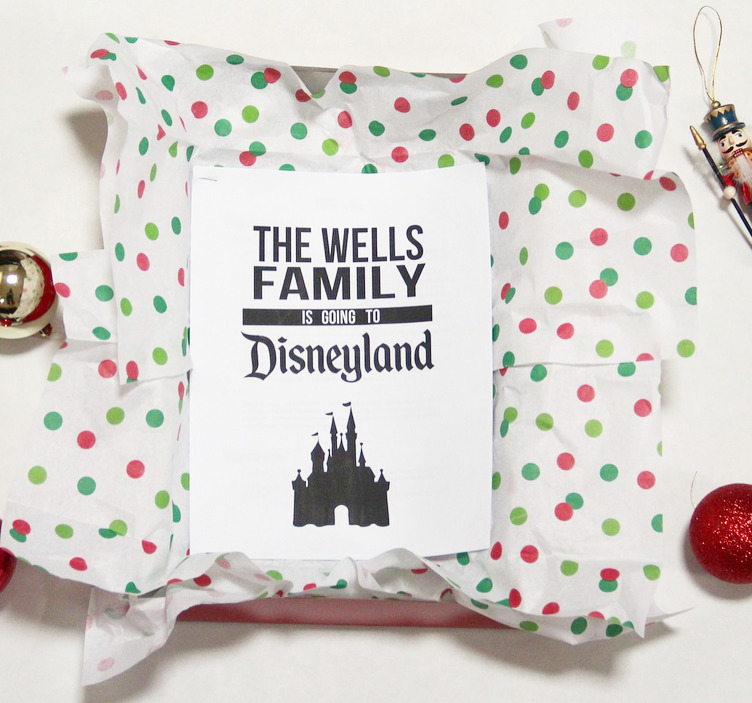 I put together a special Family Guide that you can print, wrap up and put under the tree or in a stocking so that your Christmas morning is off-the-rails exciting — but this surprise package works any time of year too! Birthday surprises, mid-winter break surprises, just-because surprises…any time of year! This guide is a slimmed-down version of the Ultimate Guide to Disneyland, written in a more kid-friendly way. (Hey, I get it — I’ve got 3 kids of my own.) Flipping through it will get them amped for the trip and talking about all the different things you’ll get to see and do (and eat). Your kids will LOVE learning about the different Disneyland rides and attractions as they help you plan your family’s trip. So, head over to my Disneyland guides and grab the Family Guide to Disneyland — and let the Christmas morning squeals begin!